Beautiful portrait...! Makes me feel homesick...! Thank you and happy to know you were able to connect Shylaja. Thank you so much Anne-Elizabeth. Like your paintings of people. So true to reality. Pardon the late response. Thank you all for the kind comments. Fantastic portrait capturing perfect expression...well done !!! I have so enjoyed viewing your wonderful portraits Usha. This is one of my favorites but I highly recommend all your work. Excellent work Usha, well done! Beautifully done. Eternal in its message. Beautiful and interesting work. Infact all your works are so powerful and communicate so much to the viewer. Keep it up. Excellent use of colours and blend. Hi Usha, I congratulate you for the beautiful work of painting an old lady which is not easy. It is truly an excellent job. Thank you for your comment. I love this interesting portrait of old age. 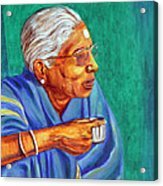 Usha i loved you painting style. All your painting clearly shows your observation power. very very nice work. all of your work deserve a praise. Hats off to you usha. well done. 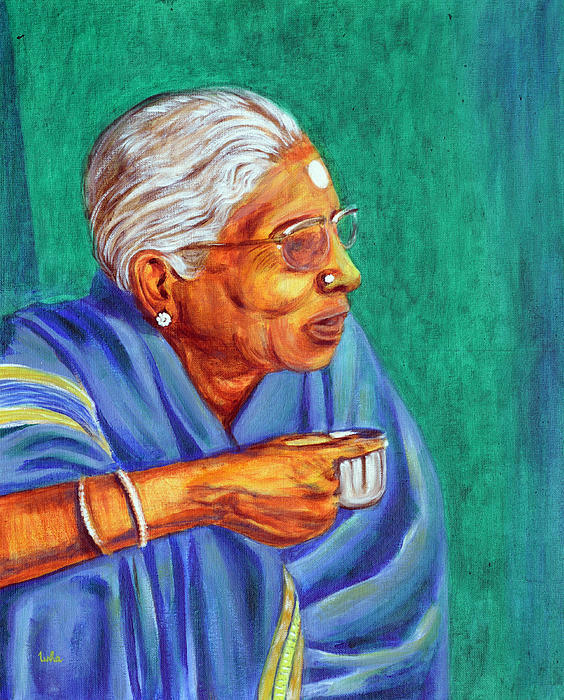 Enjoying a sip of coffee in her golden age of retired life. Gold framed. Can be shipped rolled form also.